On Friday night, two Falmouth Commodores were honored by the Cape Cod Baseball League receiving coveted league awards. One of those recipients was Michael Gigliotti, who was given the Robert A. McNeece Award for the league's top pro prospect. Gigliotti is a center fielder that is going into his junior year at Lipscomb University. He displays a sturdy frame standing 6’2” and weighing 185 pounds. In 2015, Gigliotti started in 58 games, as a true freshman, for Lipscomb. Gigliotti finished the 2015 season with a .336 batting average, 78 hits, 17 stolen bases, 28 RBIs, and 5 home runs. 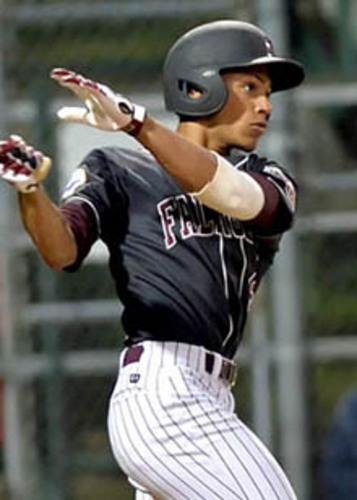 Over the course of the season Gigliotti had 20 multiple-hit games and had a fielding percentage of .985, recording only two errors out of 134 opportunities. That same season he led the nation with 22 bunt singles, which is a testament to his speed. Gigliotti’s exceptional play helped the Lipscomb Bisons win a school-record 39 games. Gigliotti also received high honors during the 2015 college season, being named a 2015 Louisville Slugger Freshman All-American, 2015 NCBWA Freshman All-American, 2015 Atlantic-Sun Second Team All-Conference, 2015 Atlantic-Sun All-Freshman Team, and Atlantic-Sun Player of the Week. Gigliotti spent the summer of 2015 playing in the Valley Baseball League, a collegiate summer league located in Virginia. He played for the Covington Lumberjacks for 21 games, tallying up 21 hits, nine RBIs, and a .280 batting average. He returned to Lipscomb for the 2016 season, where he played in 51 games. At the end of the season he boasted a .301 batting average with 58 hits, three home runs, and 24 RBIs. The 2016 Cape League season marked the beginning of an extremely successful summer for Gigliotti. He finished the regular season with a .310 batting average, 31 runs, 11 stolen bases, 18 RBIs, 48 hits, and two home runs. Gigliotti made an impact on the Commodores throughout the season, but there were two games in particular where he really excelled. On July 13th Falmouth hosted the Wareham Gatemen and defeated them 12-3. In this game Gigliotti went 4-for-5 with two singles and two doubles, as well as scoring three runs. Another notable game for Gigliotti was on July 21, when Falmouth played the Orleans Firebirds. Falmouth defeated Orleans 8-3, and Gigliotti contributed to the team’s success by going 3-for-4 with a home run, two singles, and two RBIs. His stellar performance on the baseball diamond earned him a well-deserved position on the West Division All-Star team. Most recently, No. 1 seeded Falmouth played the No. 4 seeded Hyannis Harbor Hawks in the first round of the West Division playoffs. Falmouth defeated Hyannis 6-0. Gigliotti contributed to the win with two singles, three runs, and a stolen base. The Robert A McNeece Award is named after the Chatham Anglers’ late President and Cape League official. McNeece also served as the Cape League Deputy Commissioner. People within the Cape League organization recognize McNeece’s work in the early 1960s, giving him credit and praise for creating the structure of the league that is still in place to this day. McNeece made it his mission to raise as much money as possible for Chatham and the league. In fact, the very first set of lights at Veteran’s Field in Chatham was made possible by McNeece’s fundraising. 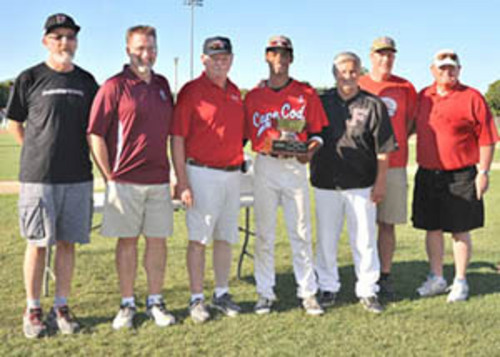 In 2008, McNeece was honored by the Cape League and placed in the CCBL Hall of Fame. Gigliotti is the first Falmouth player to receive this award since Todd Cunningham in 2009. He now joins the list of past greats to win this award including Robin Ventura (Hyannis, 1987), Chuck Knoblauch (Wareham, 1988), and Mark Teixeira (Orleans, 1999).